My only son, Andrew, entered the Provo Missionary Training Center this past week. I'm still eagerly awaiting his first letter home. I'm SO happy for him to be able to serve. The blessings for us all are great. Service to the Lord always brings greater blessings than the sacrifice required but, yes, the sacrifice is real and it is great. Until I had a missionary of my own (Amber served two years ago and recently returned home) I didn't know, for myself, the tears that would be shed in departure. It was much harder on me than I thought it was going to be. And, it was hard again with Andrew. He's my beloved and only son. His tender heart, joy, hard work, example, personality and amazing computer skills will be greatly missed. In short, it's a big sacrifice to send him out but...I wouldn't want it any other way. I know he will grow, serve, love, learn, develop and come back a better man. 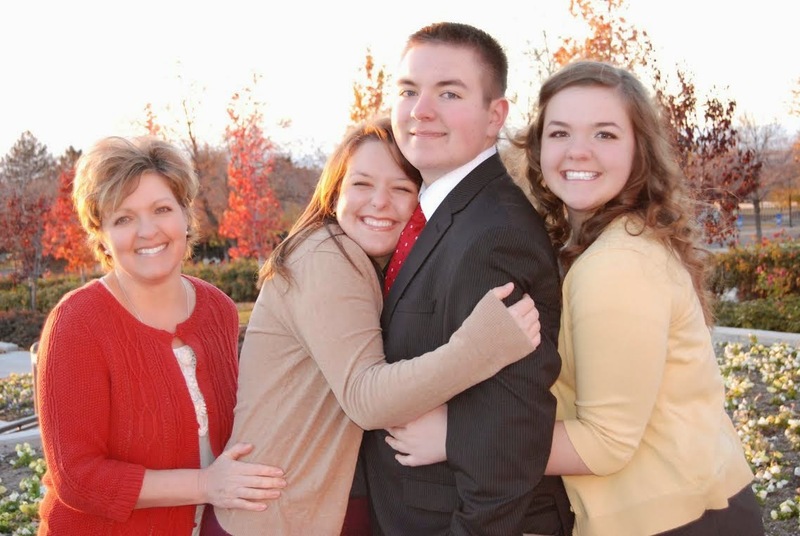 I am happy for him in a way that only other missionary moms know. But, I'm still 'processing' through the emotions that are part of letting-go and giving a child to the service of the Lord. I posted about him on our family blog if you want to read more. On this site I just wanted to thank my sister for taking our family photo on a very cold and windy day last week - before Andrew left. She was kind to do so and...it was very appreciated.